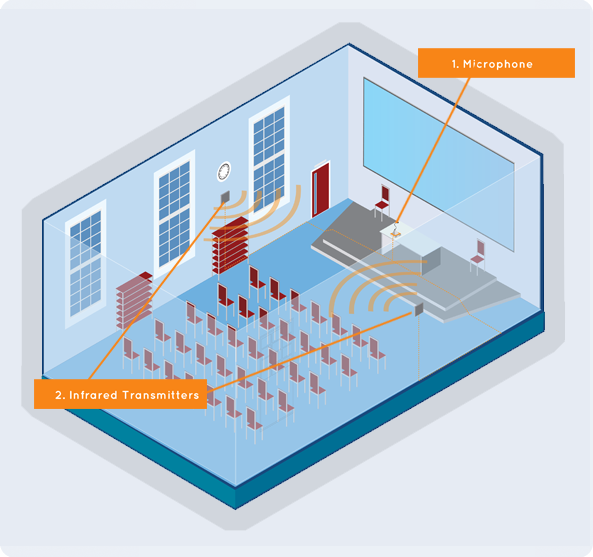 Infra-red light technology provides an alternative in certain applications to AFILS systems in order to satisfy the requirement for assisted hearing facilities. In principle it provides the means for wireless audio to be communicated to a listener to assist them in participating in the proceedings somewhere. The audio can be received by two types of receiver, one which allows anyone, regardless of hearing ability to listen (a Stethoset receiver) and another which converts the received audio into a magnetic field via a small neck worn induction loop. Either form can produce good quality audio to the listener, however the receiving equipment needs to be issued to users and collected back again afterwards to be cleaned and charged. For the venue management this requires an element of maintenance to ensure the system is available for a potential user. An Infra-red transmitter takes audio from microphones and other audio sources, such as mixing desks and CD players and processes the audio using a compressor limiter to ensure that the sound has a fixed dynamic range (so quiet sounds are amplified and loud sounds are attenuated to prevent amplifier overloading). The processed sound is then passed to an output stage which converts the audio to a frequency modulated infrared light beam. This light then passes to dedicated receivers worn by the user. This receiver converts the light to either audio for headphones, good for people with hearing loss who do not have a hearing aid, or to an induction loop coil for users with T coil equipped hearing aids. There are two basic forms of component required for an Infra-red System to function, one is the transmitter (sometimes called a Modulator) and the other is the receiver (sometimes called the Stethoset or Neck Loop). Transmitters are principally selected for their ability to cover the required area with several sizes of unit available to enable spaces of varying size to be covered. All receivers are battery powered (either replaceable or rechargeable) and require periodic checking by the provider to ensure they are ready for use. There is no limit on the number of receivers that can be used on any system at one time. A small theatre wants to help people with impaired hearing. An IR transmission system is to be installed so that they can hear the performances without any difficulty. A wideband stereo signal is to be transmitted to every seat of the theatre, with better sound quality than that achieved with the usual hearing aid. Receivers are handed out at the box office and there is also a poster which informs the theatregoers of the possibility of using the IR transmission system. The court proceedings are often confidential which can be a problem with a conventional induction loop, additionally there may be members of public without recognised hearing difficulties who struggle to hear what is being said. An Infra Red Audio System solves these problems and is the preferred choice of the Court Service in the UK.